Martha Stewart Ci sono 8 prodotti. Punch per creare bordi "Heartbeat" di Martha Stewart. Set di due fustelle "Deco Fan" di Martha Stewart. 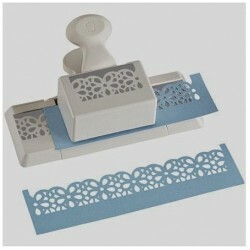 Punch per creare bordi "doily lace trim" di Martha Stewart. Layering punch "flourish frame" di Martha Stewart. Punch "monarch butterfly" di Martha Stewart. Punch "royal butterfly" di Martha Stewart. Punch "classic butterfly" di Martha Stewart. Punch per creare bordi "daisy lace" di Martha Stewart.